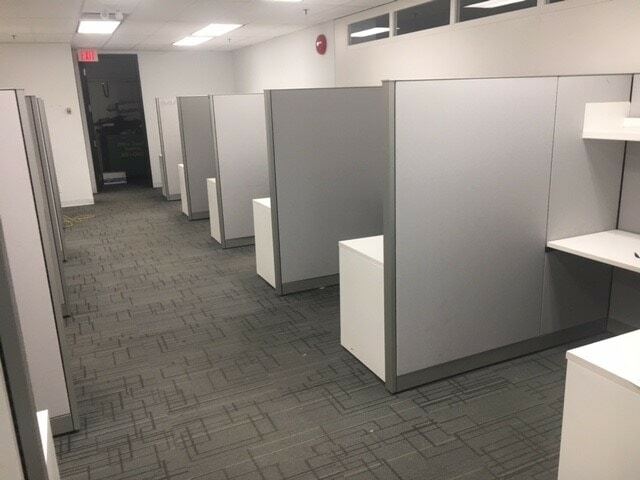 MVP Modular Systems specializes in helping Edmonton businesses outfit their offices with only the finest furniture at an affordable price. When you come to MVP – you receive the highest level of service around. We do our very best to make sure that our clients are left satisfied. MVP Modular Systems has worked with many companies in the transport and installation of their office furniture. From small chair orders to 100+ workstation installation projects – MVP is your #1 choice to help with your workstation furniture needs. Our furniture selection includes modern designs to help incorporate the atmosphere you are aiming for, while keeping employees wellbeing first. From cubicles to individual workstations; Our catalog allows for a wide variety of customization. Let us to guide you in your journey of taking your office to the next level. From the initial purchase to the installation of your new furniture we are there every step of the way. Impress clients with a wide array of contemporary styled desks, chairs, cabinets, and tables. The work day can become long and tedious. That is why your employees require proper lumbar support and height adjustment features on their chairs and desks. By creating a comfortable work environment for your employees to work in you will increase productivity, and make them happier. It’s a win-win situation because the last thing you need is a bad back from sitting all day! MVP Modular Systems can equip your office with ergonomic furniture that suits your employees needs. Prevent back pain, arthritis, and carpal tunnel syndrome with a premium set of ergonomic furniture. At MVP Modular Systems we are always trying to reduce our impact on the environment, and on your wallet. We bring in premium used office furniture and save these products from ending up in our landfills, and offer them at a discounted rate. This helps save small businesses lots of money while helping the environment, and we can feel good about that. Increase the impact of your office with a fully suited up design from MVP Modular Systems. Our expert designers will work with you to ensure only the highest level of service and quality. Having troubles figuring out your preferred layout for your office? Let the experts at MVP solve these problems. We can quickly assess what your company needs are, and complete a design that encapsulates the type of atmosphere you want. We go by our start-to-finish mentality for solving office layout complexities. MVP Modular Systems provides company owners with the advice they need to get their office started off on the right track. By contacting MVP, you are guaranteed to be offered a level of service that is unmatched in the Edmonton area. Call us today to talk about all of your office design needs. Most of our clients require delivery services for their newly acquired furniture. Luckily, MVP Modular Systems can take care of all your delivery needs. Our quick and efficient method of moving your furniture will leave your downtime minimized, and get your office looking tip-top in no time. Our track record for helping small and large companies alike with their furniture deliveries is long and trustworthy. We maintain our dependability across the board, helping Canadians all across the country with their furniture needs. We don’t waste a second when it comes to your delivery. At MVP, we keep customer satisfaction as our #1 priority! If you are wondering what to do with all of your old office furniture – look no further. MVP Modular Systems can take your old office furniture problems off your hands. With our expert removal and uninstalling process we can deal with your furniture troubles in an effective fashion. MVP Modular Systems has worked with large corporations with their moving issues in the past. Depending on the size of your company, it can be a logistical nightmare to move your office from one place to another. With many years of experience in the industry, you can trust in MVP to take care of you every step of the way. Our selection for premium new & used office furniture is always growing. Take a look at our catalog to see if any of our products fit your style and look. Need help? Contact us today to get one of our interior designers to help with the design of your office. By keeping our catalog fresh and new we are able to match our customers needs with pinpoint precision. Check out our new additions today!